Last week I had the privilege of attending two outstanding conferences, first the COMMIT Forum, a conference hosted by the Corporate Responsibility Association; followed by the Inc. 500/5000 conference, hosted by Inc. magazine. Though divergent in areas of focus, the two conferences had one unintentional theme: the incredible value of culture in guiding the direction of a company. We heard this time and time again from the well-known speakers that took the stage. Social media experts spoke about the value of reputation and engagement as measures of culture, and how that reputation is shaped by leadership decisions. Responsibility executives spoke about the struggle companies face when they form partnerships with organizations who aren’t aligned with their corporate cultures and values: the result is often a failed project. Serial entrepreneur Les McKeown spoke about the burnout that results from “over-cooked systems,” and mis-alignment of internal leaders to an overriding vision. Hubspot “evangelist” Laura Filton reminded us that generosity should be a stronghold of contemporary business culture. “Generous is the new cautious and controlled,” she said. Do you notice what these speakers ARE NOT talking about? They aren’t talking about strategy. In fact, several spoke derisively about business plans that get written, shoved in a drawer, and never revisited. Day to day decision making – the decisions that truly guide what our companies become – is almost always shaped more by culture than strategy. 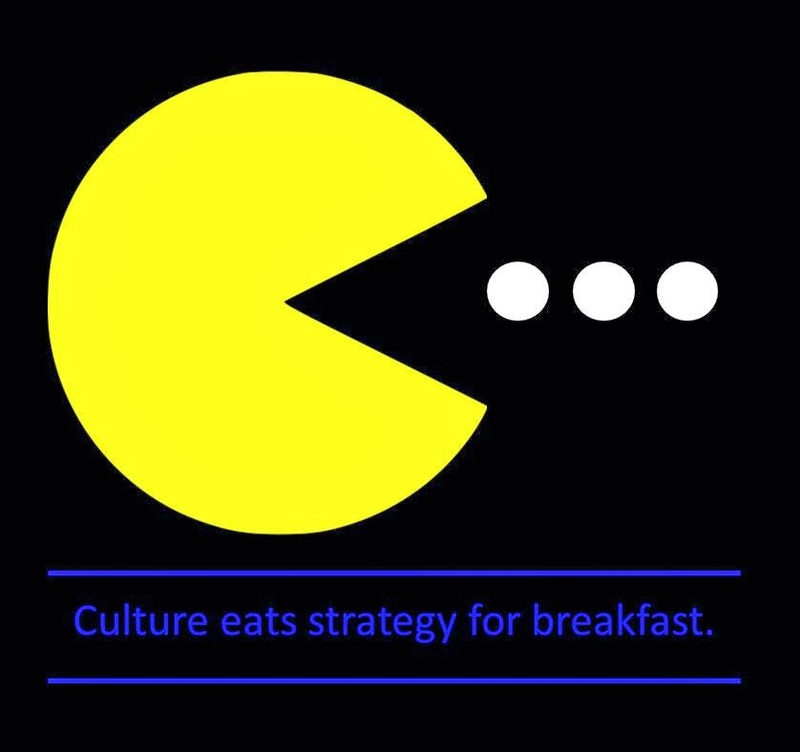 Two leaders, at two separate conferences, offered the same observation: Culture eats strategy for breakfast. Attributed to leadership guru Peter Drucker, the statement’s meaning is simple: strategy is important, but who you are, and who your company is at a core-value level, will guide your future more than any single plan. So how are you shaping culture? At the Center for Values-Driven Leadership, we’re working to understand the factors of culture that best lead to success, as defined by profit and revenue, employee engagement and retention, pace of innovation, and customer loyalty. Our Return on Values research initiative, a partnership with the Inc. Small Giants Community, asks the question, In small and mid-size businesses, what is the relationship between culture and profit? To see some of our answers, we invite you to visit our Return on Values website at www.returnonvaluesproject.com. Amber Johnson is the CVDL’s corporate relations advisor and a non-profit and small business communications specialist. For more details on the Center for Values-Driven Leadership, visit our web site, www.cvdl.org.